Kili & Truman had their own vacation while I was away. 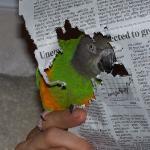 This article is about getting your parrot prepared for when you are away and making it as easy on them as possible. Lots of tips for their care in your absence. I had a feeling you had gone someplace. It has been much too quiet on your end. This is the best articles ever written on this subject. You didn't miss one detail. I'm glad that you took the time to cover this subject so well. When I first got my parrots I never left them, never wavered from their daily routine and would always schedule my day around them. But, not any more. I have found that I use most of the suggestions you have mentioned in this article. I do have one advantage...my sitter is an avian vet tech. Welcome back. I hope your vacation was outstanding. It sounds like it was a great vacation for Kili and Truman. Thanks for posting this very informative article. Not many articles on this. Thank you so much.